Welcome to a new page on Cherrapeno, where I taste, test and review some of the products that I get sent. With the sultry weather upon us, I tried both of these ice cream scoops from Oxo. The beak scoop powers through harder ice cream - you can scrape it straight from the freezer and make smaller balls. It has a 'release' button to push the ice cream off of the scoop. This one was my favourite, it was excellent for getting the ice cream out of the corners of the ice cream containers. 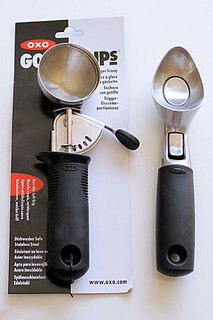 The trigger scoop retails at £10.20 and the beak scoop for £11.25. More information on the Oxo website, or find them on Facebook. Hotel Chocolat have recently launched a small collection of chocolate gift boxes for special occasions, including two 'new arrival' selections - which would be perfect to give to a new parent, royal or not ;) - and a 'congratulations' message box. I chose the 'congratulations' box (£8.00), as it was the perfect little graduation gift to accompany the university photos that I had bought for my son. There were 8 gorgeous chocolates - billionaire's shortbread, strawberry cheesecakes, simple milk truffles and - my favourite - dizzy praline. We all agreed that this was a lovely little extra to the main presents, and a great small affordable gift to give to other friends that had also graduated at the same time. 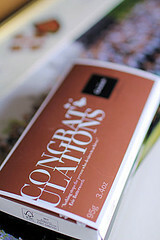 I really liked the typography on the front of the box emblazoned with the word 'CONGRATULATIONS'. 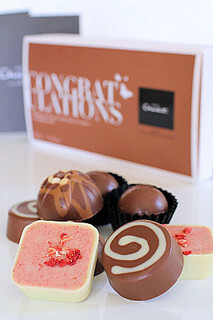 More information on the Hotel Chocolat website, or find them on Facebook. 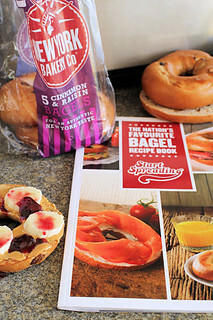 The New York Bakery Co have just launched their first crowd sourced recipe book, featuring 20 recipes from fans across the UK. The recipe book is absolutely FREE, just visit their Facebook page for more information. In the book you will find recipes for breakfast (eg 'The Terminator' - egg, bacon, cheese, tomato and lettuce), lunch (eg 'Holey Guacamole' - smoked salmon, sun-dried tomatoes, avocado), dinner (eg 'The Meataholic' - mayo, cheese, dry-cured ham, bacon, chorizo), and snacks (eg 'Beanut-Panana' - peanut butter, banana). 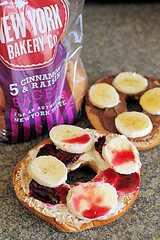 All the recipes look really good, I was sent the cinnamon and raisin bagels to try out, so made versions of the 'Choco Banana', 'Beanut-Panana' and the 'Sweet and Light'. My favourite one was the 'Choco Banana', delicious on a hot toasty bagel. More information on the New York Bakery Co website, and their Facebook page. Many thanks to all of the brands featured and to the PRs for the products. I was not paid to write this post and all views expressed above are my own.